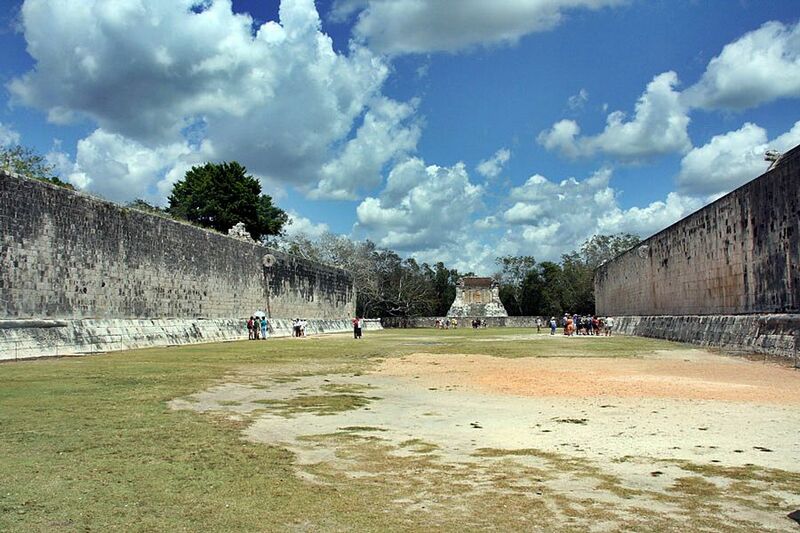 The Great Ball Court situated in the northern zone of Chichen Itza is 545 feet long and 225 feet wide. There is no vault or break between the walls and is open overhead. Each end consists of a raised temple area. A stone hoop which is engraved with intertwining feathered snakes, is embedded at the center of each wall near the top. The court’s essential design is the same in all Mesoamerica cities, although the proportion of the one at Chichen Itza is larger than the others. 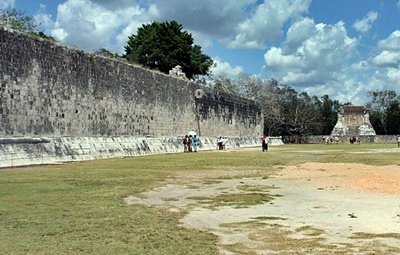 The court was built by the Mayans to play all their games. The Great Ball Court consists of: playing field, Upper temple of the Jaguar, Lower temple of the Jaguar, Northern and Southern temples. All courts are rectangular in shape, with an angled bench running at the longest lengths. These benches are richly curved with 3 panels showing detailed scenes of the players of the game. The figures’ headdress design and the specific details of each player’s costume in the carvings are different. Behind the benches, are vertical walls with the ball court’s goals positioned out of the walls. The panels at the furthest end of the wall illustrate a vine and snake scrolls coming out of the players’ mouths, signifying speaking or singing as they all seem to march towards the center panel. There is a modern myth that, the winner of each game was sacrificed however; there is no archeological evidence supporting this myth. Another belief is that the aim of the game was to pass the ball through a ring. The Great Ball Court’s two rings look like goals, so if the aim of the game was to pass the ball through the rings without the use of hands or legs then it would be quite an accomplishment. The Court was intended to represent the act of creation, and the angled benches were intended to represent the crack at the top of creation mountain. The Mayan played the game to recreate the moment when the third creation came to an end, and the start of the one we are living in today, which is the forth one.